Fast ELISA kit now available: Boster is proud to announce the newest Picokine Fast ELISA kits. Now you can perform what used to be 4+ hour ELISA assay in under 1.5 hours. 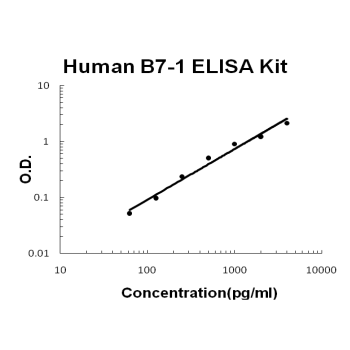 Available for Human B7-1/CD80 PicoKine™ Fast ELISA Kit and many others. Sandwich High Sensitivity ELISA kit for Quantitative Detection of Human B7-1/CD80. 96wells/kit, with removable strips. Involved in the costimulatory signal essential for T- lymphocyte activation. T-cell proliferation and cytokine production is induced by the binding of CD28, binding to CTLA-4 has opposite effects and inhibits T-cell activation. . The protein CD80(Cluster of Differentiation 80) is a molecule found on activated B cells and monocytes which provides a costimulatory signal necessary for T cell activation and survival. It is also known as B7-1. The cDNA for B7-1 predicts a type I membrane protein, i.e., one synthesized with a signal peptide that is cleaved upon translocation across the endoplasmic membrane. The protein is predicted to contain 2 extracellular domains structurally similar to those of Ig, a hydrophobic transmembrane region, and a short cytoplasmic domain. The CD80 and CD86 genes encode B7-1 and B7-2, respectively, which are structurally similar members of the immunoglobulin superfamily expressed on a variety of hematopoietic cell types. B7-1 and B7-2 provide a costimulatory signal to T cells by interacting with CD28 and CTLA4. Q: Has EK0707 been tested with urine samples? A: EK0707 was tested using urine samples from healthy human. The expression level of CD80 is very low and the O.D. values of the urine samples are barely higher than the zero well. It is recommended that the samples are ran undiluted or diluted 1:1.